From Rantau Panjang (Rantau Panjang – Tanah Merah – Machang – Pasir Puteh – Jertih – Kampung Raja – Kuala Terengganu), we took the coastal road (Jalan Pantai) to Kuala Terengganu – the capital of Terengganu state. On the way we had a quick and simple lunch at a beach stall in Pantai Rhu Tujoh. They were selling deep fried squid and fish, keropok lekor. And that was about it. By the time we reached KT, it was in the evening. And with the help of GPS, we quickly located our hotel. 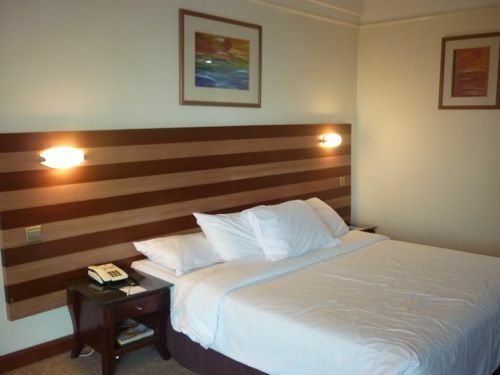 We chose Primula Beach Hotel because we wanted a hotel with a beach within walking distance. Everything was fine and dandy except one thing. When I did the booking, I specified that I wanted a non-smoking floor and non-smoking rooms. But they didn’t allocate such rooms to us. I insisted what I wanted. Only then did the receptionist hesitantly change the rooms to what I requested initially. The hotel is a bit run down but I don’t expect much from it. As long as the linens and the room are clean and tidy, I am fine. But another thing that irked me when I first arrived was there were two gentlemen smoking like there’s no tomorrow at the lobby. I asked the receptionist if they were allowed to do so in a public area like this, he nodded. I was like what the h*ll. 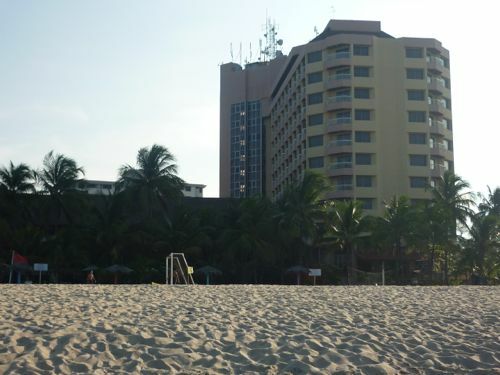 Apart from this, the beach is right next to the hotel and next to swimming pool. The beach is awesome and clean. 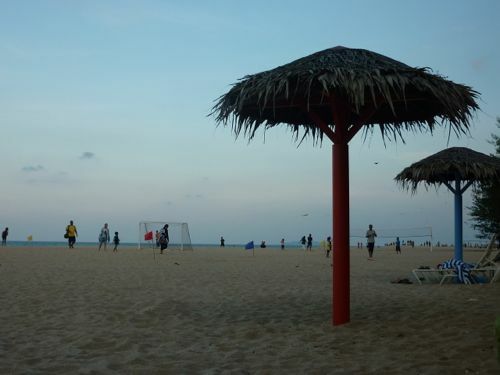 One can play beach football / soccer, kites on the beach. But not many were swimming in the sea. I believed it was not advisable to do so due to high tides. 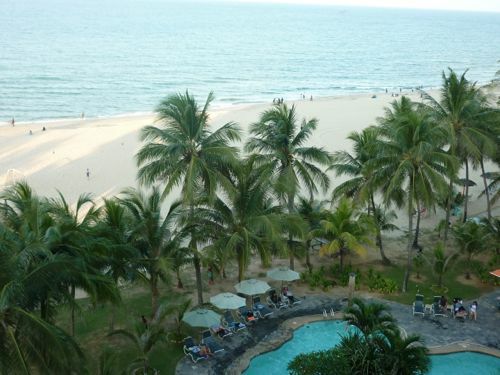 The hotel’s beach is actually adjacent to the famous Batu Burok Beach. We wanted to borrow a knife from the room service to cut our recently bought pineapples. To our pleasant surprise, the hotel staff offered to cut for us… at no costs. Not once but twice! Another plus point for the hotel despite some previous complaints. After two nights in Kota Bahru, we really missed Chinese food. The first thing we did was to hunt for Chinese food while we were in KT. 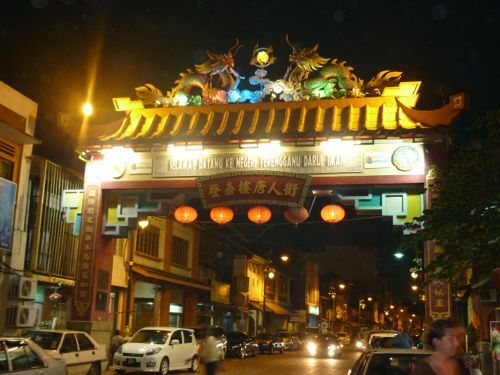 Naturally, Chinatown (officially known as Jalan Kampung Cina) came to mind. Chinatown KT is a very clean place with nicely-laid brick road. Most of the pre-war houses there are still well-maintained and are coated with bright fresh coat of paint. 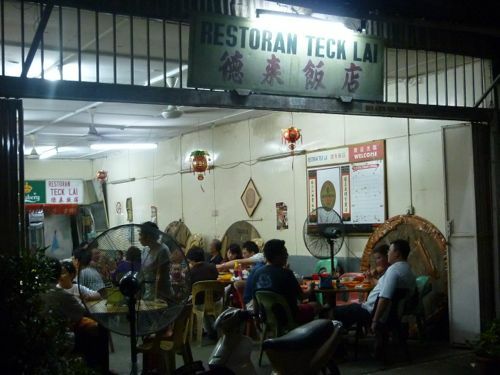 As for the first dinner in KT, we didn’t have any ideas except Soon Kee Bak Kut Teh. 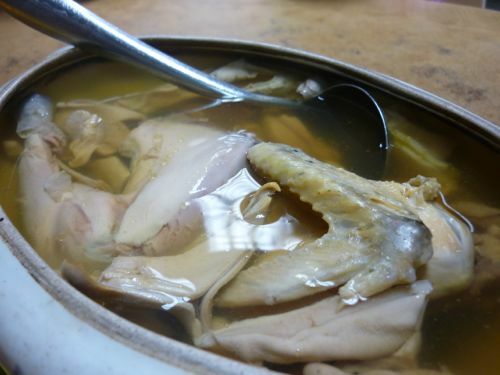 But we didn’t really feel like having bak kut teh that night. Then we noticed the restaurant next to Soon Kee was crowded. In fact, there was not much choice there at night. There are just a few restaurants open for dinner. We picked one that is bright and packed. We settled down at Golden Dragon Restaurant. We asked the lady boss to recommend some dishes. She proudly asked us to try their signature dishes: pork belly soup and yim kuk kai (salt-baked chicken). I am not a fan of pork belly, so I am not sure if it was good. We ordered 5 dishes and the total damage was RM68. I am easily satisfied but the breakfast buffet at Primula Beach Hotel was real bad. Not only did it taste awful but also the spread was small. I believe if you just go to any coffee shop outside, the food would have been much better. After breakfast, we went to Chinatown again. There’s a “historical” place that you can visit there. Located behind the main road of Chinatown, there’s an old well called Low Tiey’s Well (老爹井). 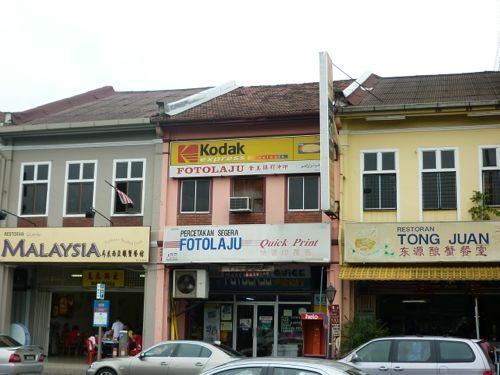 Many tourists gather along the main road (Jalan Kampung Cina). But for locals, as we found out, they hang out at the food court behind the main road. They are many stalls there offering various types of local dishes. While on the way to visit Pak Abdullah’s boat making factory, we saw a signboard of another tourist destination on Pulau Duyong: Kota Lama Pulau Duyong. Kota Lama used to be the home of a magistrate. It was built in 1919. 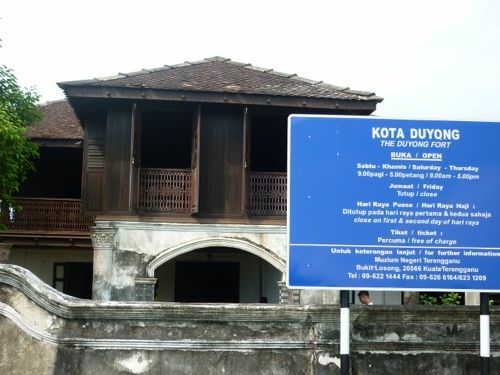 After restoration, the Malay house is open to the public. 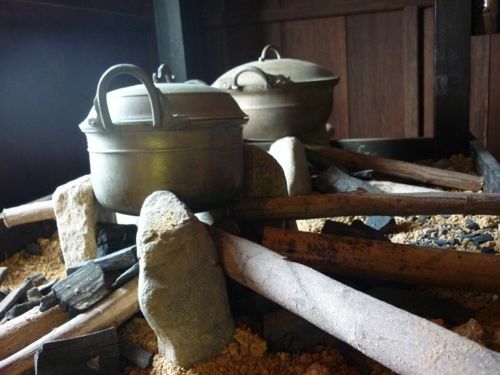 Besides the architecture, one can enjoy the exhibits such as old kitchen appliances, irons, and other household stuff. The world’s famous boat making facility is located behind the school (SR Pulau Duyong). Unfortunately, when we reached the owner, Abdullah Muda, was not in. Only a few workers were working on one of the boats behind the blue office. We took a few photos and left. This is by far the biggest museum I have seen in Malaysia. It’s huge and there is no way you can finish it all if you are in a hurry. The main building has a few galleries such as textile, royal, maritime, craft, petroleum, and natural history. Tram service is available if you fancy a quick round tour of the museum compound. RM2 for adults. RM1 for children. Tickets: RM5 – adults. RM2 for children of 7 years old and above. By the time we finished the humongous State Museum, it was way passed our lunch time and every one was complaining that they were hungry. Since the originating place of the famous keropok lekor losong is not far from the State Museum, we decided to check out Kampung Losong and have a quick bite. 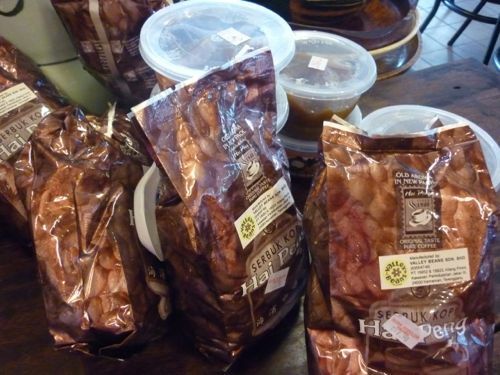 We stopped at Keropok Lekor Kak Yah. You won’t miss it as it is located at the roadside with a huge signboard – and the most crowded one. 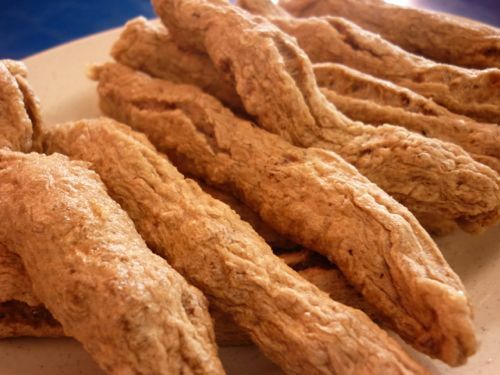 They offer 2 types of keropok lekor: steamed and deep fried. I prefer the latter. 4 pcs for RM1.00. On the way back to the hotel, we made a stop at Batu Burok Beach. 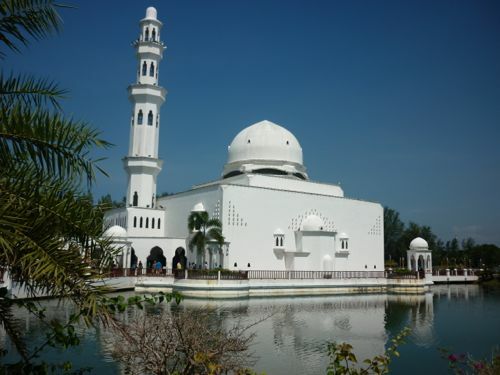 Before that since Masjid Tengku Tengah Zaharah is nearby, we stopped briefly to see the majestic “floating mosque.” Though it is built on land but when you look from far, the mosque has the illusion that it is built on water. It was afternoon and the weather was scorching hot. 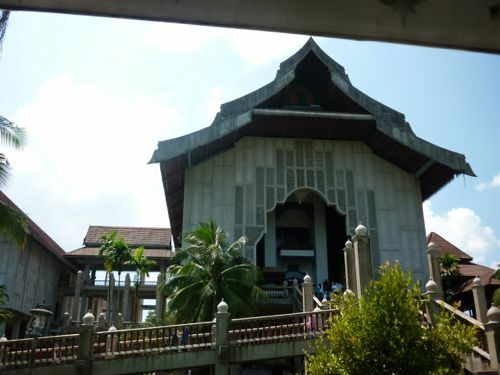 I entered the mosque and took some pictures within minutes… and left. I read that the chicken rice at Nasi Ayam Yunnan Stall is awesome and wanted to try. To my disappointment, it is nothing to shout about. The rice is just average and the soy sauce is too salty. To make it worse, the prices are not cheap, even for drinks. One area I’d like to comment is the stall – which is run by a Chinese Muslim couple – provides excellent, fast service. Before you sit down, you are already served with rice. Despite my bad review and you find yourself still want to try this halal chicken rice, it is Stall 36 at Pantai Batu Burok. Each plate of chicken rice costs RM5.50. Before I reached there, I thought Pantai Batu Burok (Batu Burok Beach) would be dirty since it is a public beach. Boy I was in for a surprise. The beach is not what I thought. It is a long, clean, white, windy beach. We just walked along the beach – enjoying the wind, observing people. The beach was buzzed with activities due to weekend. It was not suitable for swimming due to strong currents. 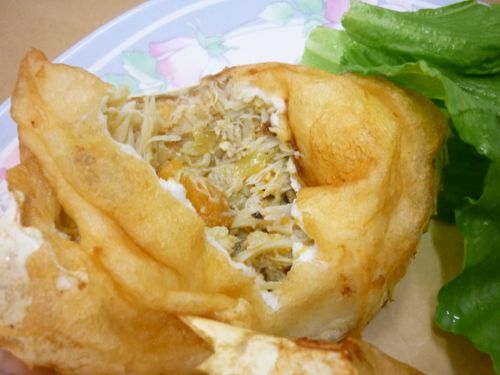 Batu Burok Beach is also famous for its fried ice cream but we didn’t try. 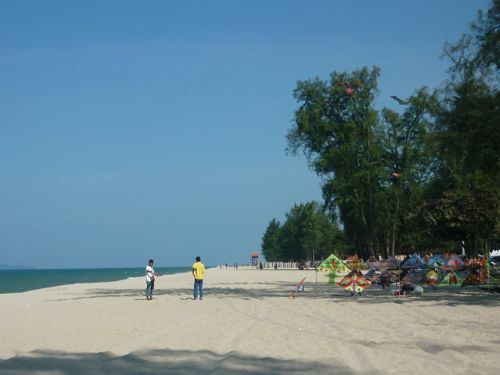 In fact, Pantai Batu Burok is just a short distance from the hotel we stayed. It’s worth a visit. We saw this restaurant the night before when we had our dinner at another restaurant called Golden Dragon Restaurant. Teck Lai is just behind it. The ambiance of this eating place is everything but great. Nothing fancy here but we noticed many locals (they didn’t look like tourists) patronize this place. It turned out we were right. 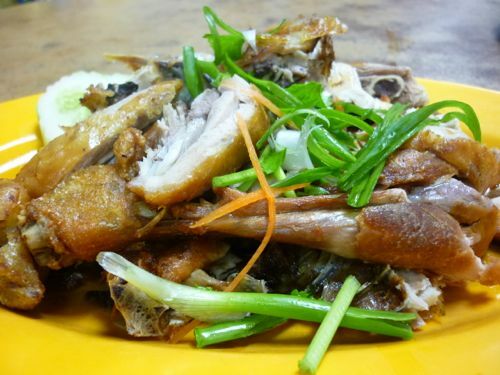 This restaurant cooks up nice local Chinese cuisines and guess what… they’re cheap. Our dinner made us only RM54 poorer. We had steamed fish, hotplate tofu, stir-fried sweet potato leaves, foo yong egg (omelette with oinons). Did you notice the "little" signboard? I had been looking for this humble restaurant since the first day I came to Kuala Terengganu. This eatery is listed in a hawker food guide and I told myself I must find this place. The problem with this restaurant is the signboard is just too small to be noticed. If you drive pass, you will definitely have a hard time locating it. I only found it after I took a stroll down Chinatown while waiting for my dinner the night before. The shop is located at the beginning of Jalan Kampung Cina before the crowds and buzz area. And it’s right before Tzu Chi Building. 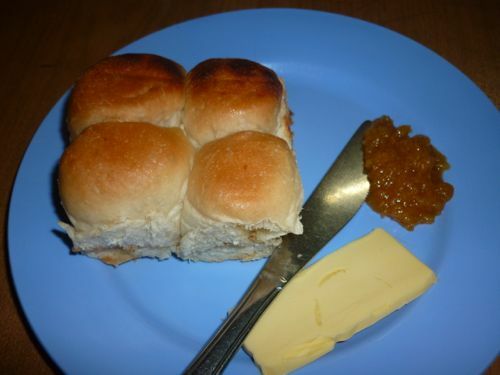 Shin Ping Xiang is famous for its mini toast buns (also called roti paun). 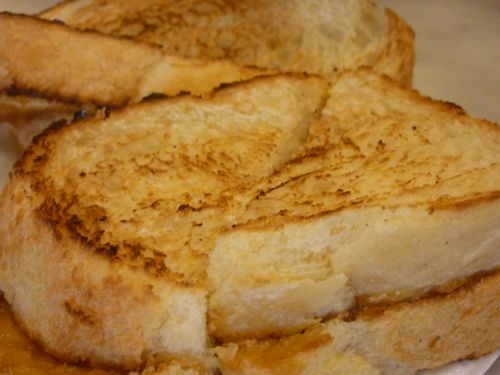 It’s like the normal toast bread and it is famous for breakfast with the exception that mini buns are used. It’s tasty. It comes in a set of 4 buns for one serving. Each set is RM1.80. Besides roti paun, Shin Ping Xiang also serves noodles such as wat tan hor, Hokkien mee, and all. They all taste excellent as well. Bukit Puteri is a small hill in the middle of Kuala Terengganu town and it is adjacent to Istana Maziah and post office. The hill is fronting Shahbandar Waterfront and when you are up there, you can have a nice view of the town. The steps leading up to the hill can be quite steep for some. So be careful. By right, you need to pay for the admission. However, when we were there, there’s no one there to collect the fees from us. In the old days, the hill is used as a fort in wars. And it used to be a meeting place for the Sultan to discuss state matters long time ago. Admission: Adults RM1.00. Children RM0.50. We started the journey to Kuantan from Kuala Terengganu at about 10.30 am after visiting Bukit Puteri. Since we wanted to enjoy scenic view, we took the Coastal Road (Jalan Pantai). Once we reached Marang, there are many stalls lining the roadside. These stalls sell salted fish, keropok and other dried foodstuff. 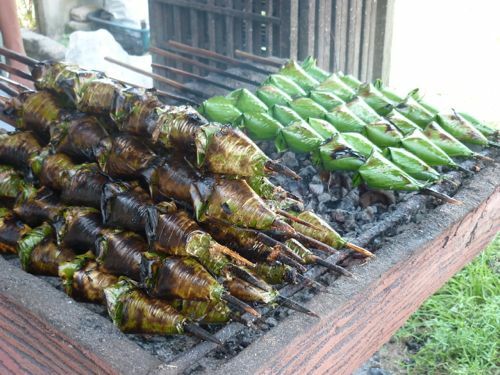 One of the popular local food is sata (sometimes satar). I had never had this before but wanted to try. 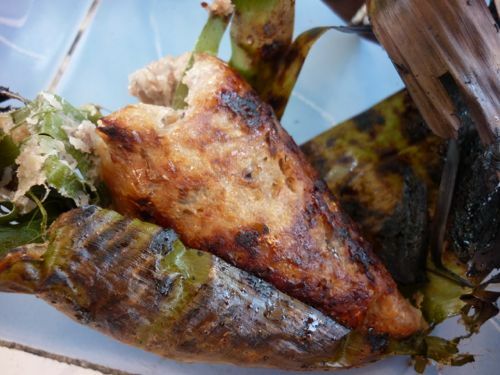 Sata is grilled fish with onion, chilli, and with other ingredients. It tasted okay but very spicy. If you are familiar, it is like otak-otak. We bought 5 sticks and it costs RM2.00/stick. After a long journey from Kelantan, we reached Kemaman (also Chukai or Cukai) at 2 pm. Everyone was hungry and we wanted to try out a restaurant recommended by a friend. But we couldn’t find the eating place after a few attempts to locate it. 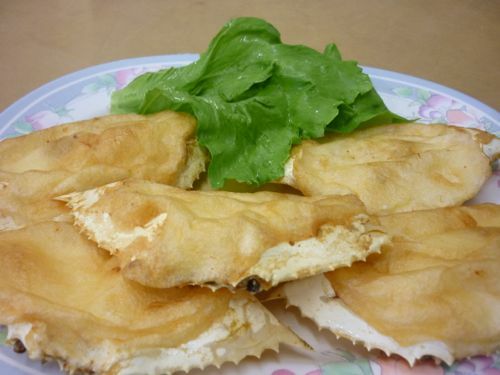 Although we wanted to try out the famous Kemaman stuffed crabs at Tong Juan, but due to the huge crowd (yes even at 2pm! ), we finally settled at a restaurant called Restoran Malaysia next door. Restoran Malaysia also offers stuffed crabs and it was also crowded. I noticed there were many travelers and foodies from other towns. I think the stuffed crabs are overhyped and I don’t really fancy them. They are just okay. But if you have not tried it, just trying it once is more than enough. The rest of the dishes we ordered were good and I was happy with the quality of food there. Total bill was RM97. We ordered 5 stuffed crabs (RM7 each), stir-fried squids (sotong) RM15, stir-fried kailan RM15, and tofu RM15 besides rice and Chinese tea. 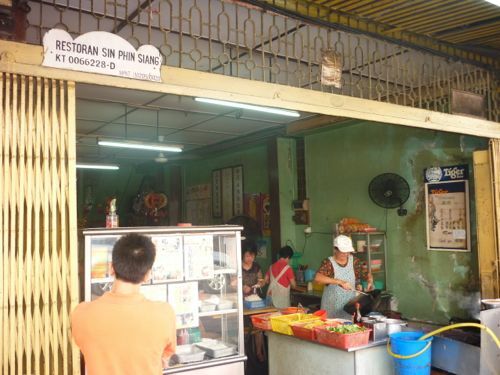 How can you visit Kemaman without stopping by at the historical and famous Hai Peng coffee shop? Since we were already there, I wouldn’t want to skip this traditional kopitiam (coffee shop) turned modern cafe. Since we just had lunch at Restoran Malaysia, located just along the same road, we thought it would be a good idea to take a stroll to Hai Peng for a cuppa. Firstly, we could do some exercise and secondly, we hoped that the walking could help us digest faster so we could have another round of meal! Mind you, Jalan Sulaiman is a long road and it requires some effort to walk from one end to the other. Hai Peng which is located right at the beginning of Jalan Sulaiman, has its own buidling. When we reached, the place was already packed with coffee lovers. Again, it surprised me that the customers were from all walks of life and different races. Besides having coffee and toast there, I took home some coffee powder as well. In fact, it took me 2 months to finish the 500g coffee powder which I consumed every day. I must tell you that the Hai Peng coffee is something to be reckoned with. It’s aromatic and thick. I highly recommend it. It is definitely better than what I had at White House, Kota Bharu. 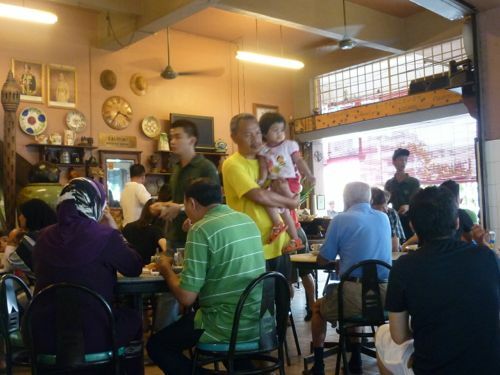 Besides coffee, Hai Peng also offers half-boiled eggs, coffee mugs/cups, nasi lemak bungkus. Prices: Kopi-o (black coffee) RM3, kopi (coffee with milk) RM3, toast RM2 a set, ice blended coffee breeze RM6.90. 500g coffee powder RM17.90. 3-in-1 coffee 20 bags RM24.90.